Member of the Compositae or Asteraceae (aster family). 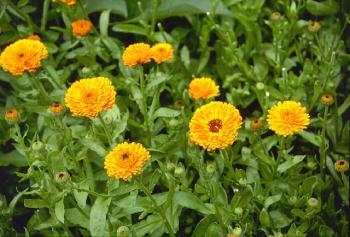 Common relatives include chrysanthemum, dahlia, zinnia, lettuce, chicory, endive, dandelion. Double, daisy-like flowers, 2-4 inches across, one per stem. Stems mostly 12-16 inches long, tend to be twisted. 36-41 F in water for short time. From the Latin “calendae” referring to the belief that it was always in bloom on the first day of the month. The specific epithet name officinalis means both official and medicinal, the latter definition is likely more applicable to this species. Calendula flowers, which contain stimulating properties, were once used for healing wounds, treating ulcers and preventing sickness. Today, the flower heads, when dried, are used to flavor soups and stews and as coloring for butter. According to Creasy (1999), fresh petals are edible. Can be used in soups, omelets, souffles and rice dishes. Ancient Egyptians valued calendula as a rejuvenating herb, Hindus decorated temples with it, Persian and Greeks garnished and flavored foods with its golden petals. Flower heads may close at night. The Compositae or aster family is vast, with over 20,000 species, and is also one of the most developed families. It was named Compositae because the flowers are actually a “composite” of many individual flowers into one head. Hence, when children pull one “petal” off at a time, saying “she/he loves me, loves me not”, they are actually removing a complete flower, not just a petal.